If you’re using the Track Changes feature in your Word 2013 documents to ensure that nobody makes any unnoticed changes in a document, you may want to take a further security step and restrict changes to tracked ones only. You can also password-protect this restriction so that nobody can sneak changes into your document without them being tracked. Open Word 2013 and select a document in which you would like to prevent untracked changes. On the top of the screen, choose Review→Restrict Editing. The Restrict Editing task pane opens to the right of the document. This pane has three questions for you to consider about how you want to restrict the editing of your document. In the Editing Restrictions section, select the Allow Only This Type of Editing in the Document check box, choose Tracked Changes from the drop-down list, and then click the Yes, Start Enforcing Protection button. The Start Enforcing Protection dialog box opens. 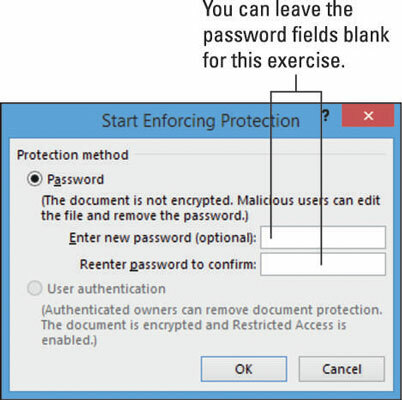 In the Start Enforcing Protection box, click OK.
You can password-protect change tracking, but in this exercise, you don’t. When you password-protect change tracking, only the person with the password will be able to make changes to the document. Try to choose Review→Track Changes. The Track Changes button is disabled, so nothing happens. In the Restrict Editing task pane, click the Stop Protection button. The Track Changes button is once again clickable. Choose Review→Restrict Editing to close the task pane.